Toledo, Ohio, Aug 28, 2006 - Two years after announcing that the Chrysler Group would create the first supplier park in North America to produce the Jeep® Wrangler and Wrangler Unlimited, customer-ready vehicles are rolling-off the production line at Chrysler's new Toledo Supplier Park (TSP). As part of Chrysler Group’s innovative manufacturing project in Toledo, three supplier partners will manage and operate major parts of the vehicle production process from neighboring facilities within the Toledo plant footprint. While the KUKA Group is responsible for building bodies for the all-new 2007 Jeep Wrangler and Wrangler Unlimited, Magna Steyr will run the paint shop and Hyundai Mobis-owned Ohio Module Manufacturing Company (OMMC) will assemble the vehicle’s chassis. 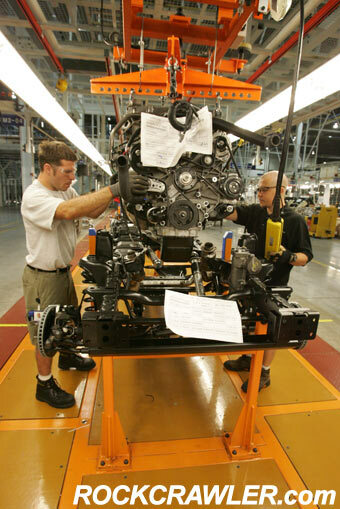 Chrysler Group has the responsibility for the final trim and assembly operations of the plant. All four facilities were completed earlier this year and have been producing pilot parts since April. Chrysler Group President and CEO Tom LaSorda (second from left) is joined by supplier partners and government officials marking the start of production for the all-new 2007 Jeep Wrangler and Wrangler Unlimited at Chrysler’s new Toledo Supplier Park (TSP) today. As part of Chrysler Group’s innovative manufacturing project in Toledo, three supplier partners will manage and operate major parts of the vehicle production process from neighboring facilities within the Toledo plant footprint. Pictured with LaSorda are, from left: Hyundai Mobis Vice Chairman Kyu-Hwan Han; Ohio Governor Bob Taft; UAW Regional Director Lloyd Mahaffey; Toledo Mayor Carty Finkbeiner; U.S. Senator George Voinovich; UAW President Local 12 Bruce Baumhower; Congresswoman Marcy Kaptur; Congressman Paul Gillmor; KUKA Schweissanlagen GmbH President and CEO Gerhard Wiedemann, and Magna International President Mark Hogan. "Two years ago, the Toledo Supplier Park existed only as a vision," said Tom LaSorda, Chrysler Group President and Chief Executive Officer. "A vision so bold, so unique, that we knew it would only succeed with a team that is dedicated, disciplined and, of course, flexible. We thank the United Auto Workers and the Toledo workforce for making this vision a reality." 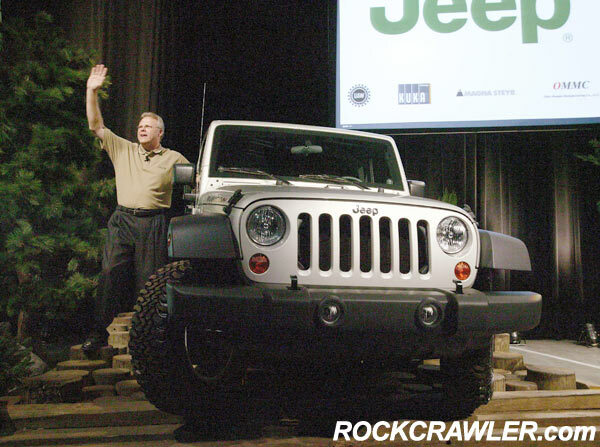 Chrysler Group President and CEO Tom LaSorda shows one of the all-new 2007 Jeep Wrangler Unlimiteds marking the start of production at Chrysler’s new Toledo Supplier Park (TSP) today. As part of Chrysler Group’s innovative manufacturing project in Toledo, three supplier partners will manage and operate major parts of the vehicle production process from neighboring facilities within the Toledo plant footprint. 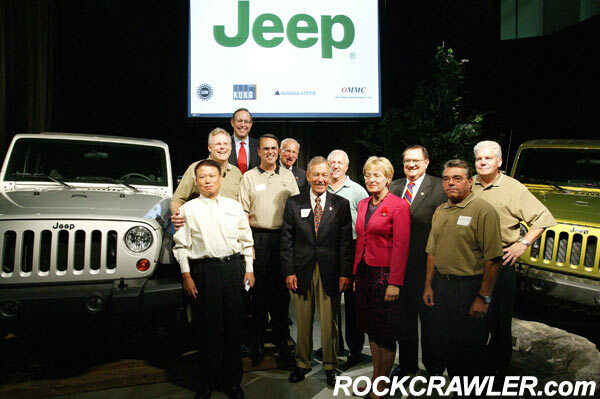 Chrysler Group executives, local employees from the United Auto Workers, dignitaries and guests celebrated the opening of TSP and production of the all-new 2007 Jeep Wrangler and Wrangler Unlimited. "The Supplier Park has not only brought a significant, new investment to the Toledo area," said Lloyd Mahaffey, UAW Regional Director. "But, also proves that working together, the UAW, government and Chrysler Group can create good paying jobs in America." 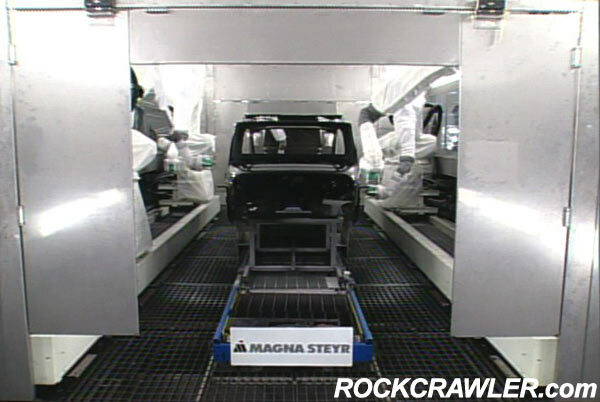 The painted vehicle body and the chassis module are sent on conveyor lines directly into Chrysler Group’s final assembly building, where all vehicle components are married together to create the finished vehicle. From start to finish, Chrysler Group is working rigorously with all supplier partners to maintain the highest levels of quality in each area of the assembly process, including a series of final validation tests for each vehicle as it comes off the line. New methods of material flow are being implemented to manage the complexity of the two models being built on one assembly line. An inbound sequencing center is housed in the adjoining Stickney complex and manages more than 1,800 different parts that are used in the Dodge Nitro, Jeep Liberty and Toledo Supplier Park's Jeep Wrangler two-door and Jeep Wrangler Unlimited four-door build process. In addition to sequencing, this center provides parts metering, kitting and container management to both Toledo North and Toledo Supplier Park Assembly Plants. This co-location project between the three supplier partners and Chrysler Group in Toledo is part of a $2.1 billion total program investment. The Chrysler Group has invested approximately $3.9 billion into the Toledo area over the past five years. The investments include an original $1.2 billion to build the Toledo North (opening in 2001) combined with an expansion of Toledo North that gave the plant the flexibility to add the new Dodge Nitro to the Jeep Liberty assembly line. "The supplier park represents one example of Chrysler Group's overall flexible manufacturing strategy," said Frank Ewasyshyn, Chrysler Group Executive Vice President – Manufacturing. "Our flexible manufacturing strategy involves a number of actions that enable multiple products to be built on the same assembly line and alternative practices to traditional vehicle assembly." "This level of cooperation with select suppliers allows the Chrysler Group to direct more resources to developing new vehicles and bringing them to market with the highest levels of quality," said LaSorda. Total capital investment for the Toledo Supplier Park project is projected to be $900 million. Throughout Jeep Wrangler's 65-year-history, Jeep engineers have ensured that each new generation Wrangler delivers – and improves upon – its world-class off-road capability, open-air fun and freedom, and interior comfort and convenience. For the all-new 2007 Jeep Wrangler and Wrangler Unlimited – the sixth generation of Wrangler models – Jeep engineers focused on more than 50 functional objectives – from ground clearance to articulation to ride and handling. The result is the ultimate "out-of-the-box" off-road vehicle combined with everyday practicality and all the necessary features to "go anywhere and do anything." Over the years, freedom, authenticity, mastery and the capability to go anywhere and do anything have become the hallmarks of the Jeep brand and the basis for its SUV leadership worldwide. Jeep four-wheel-drive vehicles are built and sold at the rate of more than 600,000 vehicles each year. Chrysler Group manufactures Jeep vehicles in the U.S., Austria, China, Malaysia, Thailand, Indonesia, Venezuela, Argentina and Egypt. The Toledo area has benefited from two new assembly plants as well as new vehicles. 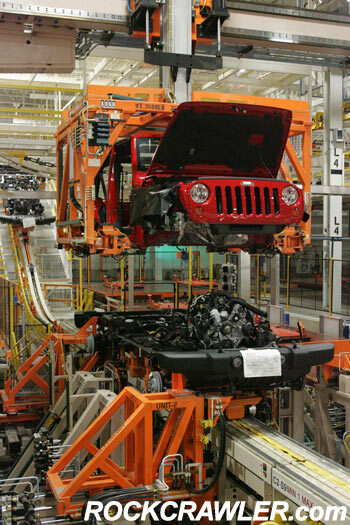 Besides the Jeep Wrangler and Jeep Wrangler Unlimited production at the Toledo Supplier plant, production of Jeep Liberty at the Toledo North Assembly plant began when the plant opened in 2001. Production of the new 2007 Dodge Nitro began last month. The new Toledo Supplier Park replaces Chrysler Group's Parkway and Stickney assembly operations which have built Jeep brand vehicles since the 1940s. 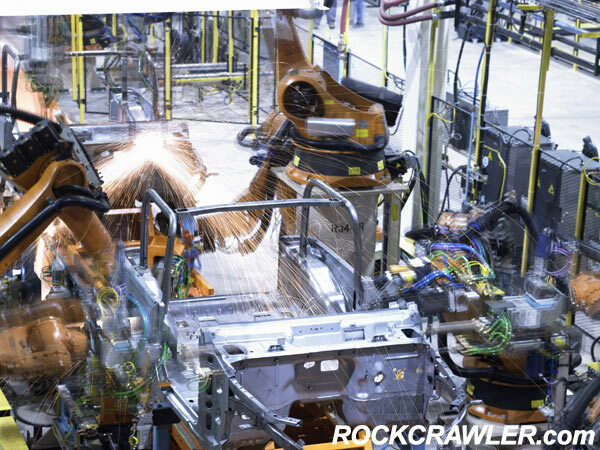 "The new Wrangler manufacturing model, combining three major suppliers and DaimlerChrysler represents a new way of doing business for DaimlerChrysler and the UAW, said UAW Local 12 President Bruce Baumhower. "This is a major accomplishment for our union's members as well as a major step in assuring good paying manufacturing jobs in the Toledo area for years to come. The TSP location is 2.0 million square feet with 1,400 employees while the Toledo North Assembly Plant is 2.10 million square feet and has more than 2,700 employees. Employees at both plants are represented by United Auto Workers Local 12. In total, Chrysler Group has made a significant impact on the City of Toledo and the State of Ohio, with 7,941 employees statewide generating $465 million in annual wages and providing more than $26 million taxable income to the state. Chrysler Group as a good neighbor good citizen, sponsors various community events through its philanthropic arm, the DaimlerChrylser Corporation Fund, including the Art Tatum Jazz Heritage Festival, Toledo Urban League, City's Youth Entrepreneur Program, Toledo Opera, the Toledo Museum of Art, Valentine Theatre and the Diamante Awards.